Rekha and Vidya Balan wore traditional saris at the filmfare awards. Rekha was in her traditional avatar of Kanjeevaram sari with a potli, side swept hair and lots of jewelry. While we love Vidya Balan's gold sari, we do not like the way she draped it. (Free flowing drapes are always better than pinned versions unless you are working in an office or airlines). Secondly we also do not like the loose fit of her blouse sleeve. Nay. 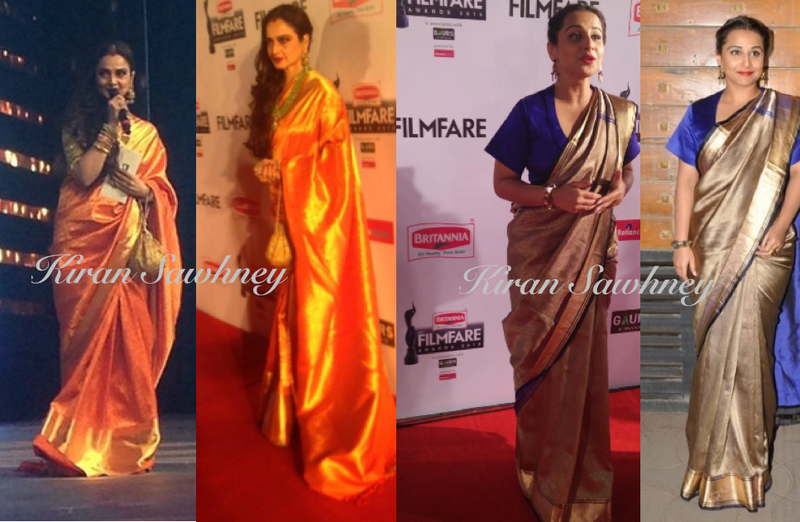 Which sari look do you prefer?